A musical comedy-drama celebrating the healing powers of music and dance, Footloose bounces on its own giddy energy, propelled by a joyous soundtrack and a cast of talented young actors. Directer Herbert Ross assembles the film with one eye on maximizing the fun quotient and the other on maintaining the colourful characters at the centre of the drama. Teenager Ren (Kevin Bacon) relocates from Chicago to the small rural town of Bomont. Ren is an athletic dancer with a positive outlook on life, but he finds Bomont seething under the domineering influence of Reverend Shaw Moore (John Lithgow), who delivers fire and brimstone sermons banning dancing and popular music throughout the town. The Reverend has taken it upon himself to save the soul of Bomont, after a car crash killed a group of partying teenagers, including his son. Neither Moore's wife Vi (Dianne Wiest) nor his teenage daughter Ariel (Lori Singer) are keeping up with him. Vi is concerned that the town is taking his message to extremes, and indeed there are rumblings of impending book burnings. Ariel is in full fledged teenage rebellion mode, running wild with her group of friends, including the fun-loving Rusty (Sarah Jessica Parker), and sleeping around behind her father's back with the local no-good redneck. Ren makes a few good friends, notably the slow but well-meaning Willard (Christopher Penn), and attracts the attention of Ariel, but otherwise finds himself a misfit in the crusty community. He decides to shake things up by organizing a school dance in defiance of the Reverend and all the town elders. Written by Dean Pitchford, Footloose never attempts to take its superficial context too seriously. But the film does connect interesting dots on the perils of extremism, and Ren gets to use Biblical passages that support dancing to argue against the zealots running the town. 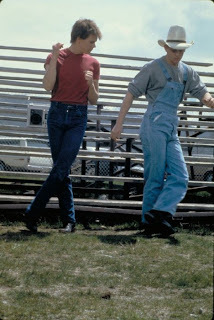 Footloose does have a few weaknesses, notably a couple of ugly fights that appear utterly contrived. Arial comes out of one brawl pretty badly bruised and battered, but her previously ultra-concerned dad does not seem to notice. However, the weak moments do not take away from an overall mood of infectious exuberance. Ross inspires his cast to deliver terrific performances. Kevin Bacon, in one of his most memorable roles, shines as Ren, a cool cat of a character, full of optimism and bright ideas, and a refreshing, positive personality. Lori Singer smoulders as Arial, compensating with a brooding sexuality what she lacks in talent. Christopher Penn gets the most memorable supporting role as the dorky but game Willard, and the montage of Ren teaching Willard how to dance to the tune of Let's Hear It For The Boy became a much imitated classic. The adults add substantial weight to the talent on display: both John Lithgow and Dianne Wiest bring a serious tone to their roles. As Reverend Moore, Lithgow rumbles through Footloose imposing his own version of the commandments, but gradually comes to realize that he is simultaneously losing his daughter and unintentionally driving the community to the dark alley of self-defined intolerance. The soundtrack of Footloose displaced Michael Jackson's Thriller from the top of the charts and stayed there for 10 weeks. 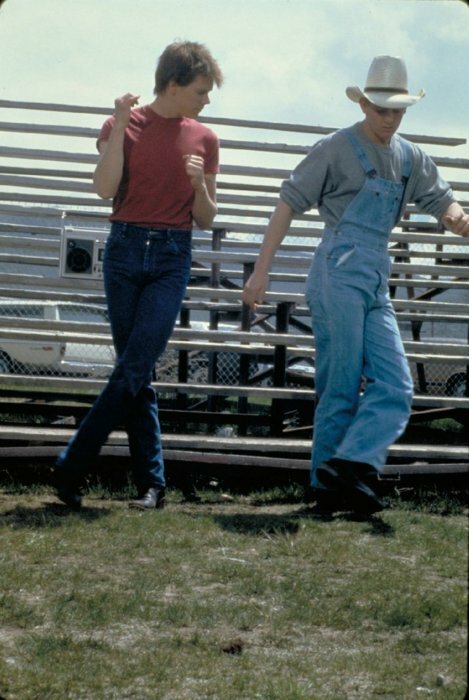 The title track Footloose, Let's Hear It For The Boy, Almost Paradise, and Holding Out For a Hero, among others, embedded themselves in the soundtrack of the 1980s. The music, much like the movie itself, left a lasting and upbeat impression on the cultural landscape.